Hardwood flooring is beautiful. It provides a sophisticated and antique look to any residence. While it’s warm, inviting, and gorgeous to have in your home, it can also be very difficult to maintain and there are certain don’ts that should be taken into consideration before you decide to get hardwood flooring. If you want to maintain the look of the hardwood floor, then it’s best that you clean it continuously and abide by some rules on how to keep those planks of wood pristine. No matter the type of hardwood flooring you decide on, the basics for this type of flooring is to clean it often and to avoid wearing certain types of shoes. Hardwood flooring has been used for centuries and is a great option for your home as long as you know that you have to perform certain upkeeps to ensure it looks good. For more information on hardwood flooring installation, take the time to contact Zoltan European Floors, Inc. In past blogs, we’ve touched on the maintenance of hardwood flooring, which is why today, we’ll go over some don’ts that you need to abide by to ensure that your flooring is perfect. While it can be a time consuming activity, cleaning your hardwood floor will keep it the way you want it to look. In addition, before you decide on hardwood flooring, it’s vital that you understand what you can and can’t do on hardwood flooring. You should also try to avoid hardwood flooring in your home if you have pets, small children, or older people because it can be a nuisance for you as the homeowner to maintain. With these four things that you should never do on hardwood flooring, you’ll be able to know if hardwood flooring is the right choice for your home. Keep in mind that laminate is always an excellent option for families with kids, pets, and older people. 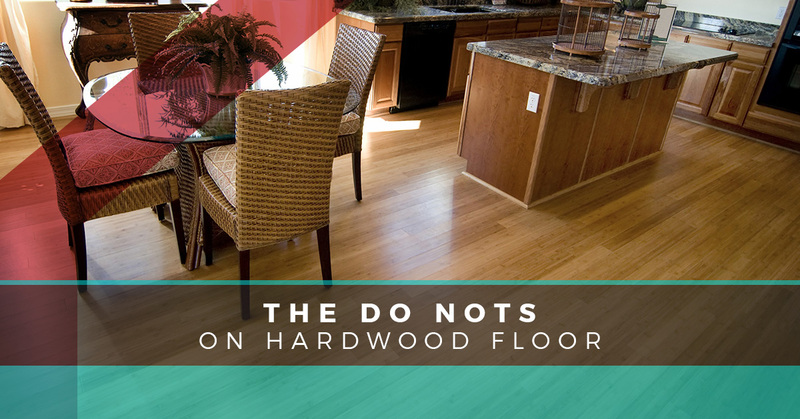 The first don’t on the list is to avoid putting down hardwood flooring in a moist environment. This means that you shouldn’t put hardwood flooring in bathrooms, basements laundry rooms, and even kitchens because the environment can become very humid. Humidity can end up warping the flooring, which is something that can create irreparable damage to the wood planks. By putting hardwood flooring in an excessively moist area, you’ll have to deal with potential damage to your beautiful floors. Did you know that you need to use certain cleaners in your home when you have hardwood flooring? You should always use hardwood flooring cleaners because they are the right product to clean and maintain your flooring. If you use wax-based cleaners, hard detergents, steel wool, or any other type of abrasive cleaner, then you could be looking at a damaged hardwood floor. You could dull the finish of the hardwood or you can impair the planks of wood because of what’s in the cleaners. Water will warp and ruin the planks in your home. We touched on putting hardwood flooring in moist environments, but you should also never clean your flooring with water. A lot of water will damage the flooring to an irreparable point or you’ll need to spend a lot of money on fixing the planks of wood. When you clean your flooring, you should never use water and instead use dry materials to get your planks as clean as possible without using ingredients that will damage them. When you’re in heels make sure that you take them off before you walk into your house and on the hardwood flooring. Whether you have athletic spikes or high heels, you could damage your hardwood flooring if you walk across the planks. High heels, no matter how high they may be, will scratch at the planks and athletic spikes will do the same. While you may hate taking those heels off, it’s vital that you avoid scratching the surface of your beautiful, vintage hardwood flooring. Are you interested in getting hardwood flooring in your home? Take the time to contact Zoltan European Floors, Inc. for more information on this flooring option.